If you want a set of matching holiday pajamas that feels classic and festive, we love this red plaid set from SESY. 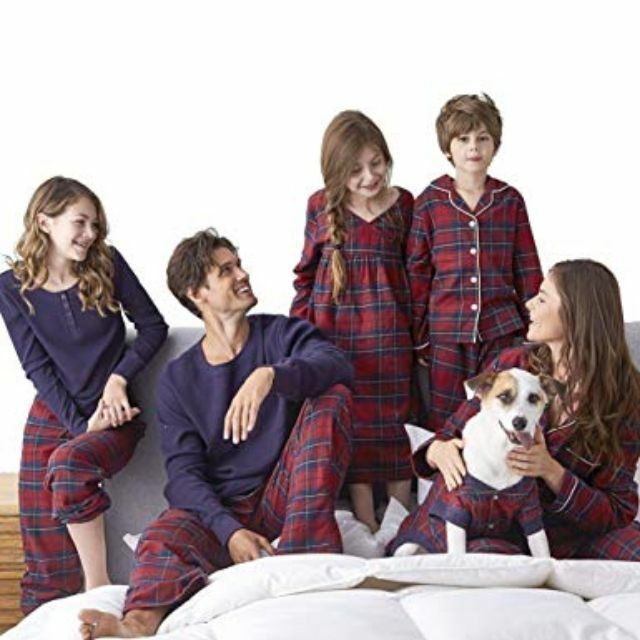 These 100% cotton pajamas offer family members the ability to mix and match, as you can choose from head-to-toe plaid or throw a Henley style top into the mix. Of course, the pajamas come in appropriate sizes for adults, children, and Fido. Customers say the pajamas are great quality, run mostly true to size (read the chart for fitting guidance)—and most importantly, turned their Christmas photos into a huge success. The material is neither too thick nor too thin, and as comfortable for lounging as it is for sleeping. This set comes in sizes ranging from a 3-month baby bodysuit to XXL men’s, and owners say they fit true to size. Reviewers also mention that though the pajamas aren't see-through, they’re pretty lightweight—which is perfect for sleepers who run hot. If you want a classic family pajama set that you can wear all year long, this collection from Target is a great choice. Long-sleeved Henley shirts are oh-so-comfortable, and this PajamaGram Snowfall Plaid Matching Family Pajama Set will be so comfortable you won't want to take it off. These blue thermal tops (100% cotton in the adult sizes, polyester in the kids) come paired with full-length plaid pajama pants, which feature a snowflake pattern for an extra dose of holiday cheer. The Henley-style shirts feature red piping around the arms and neck, and they’re neutral enough to wear on their own as a cold weather top. The set includes sizes for men and women, kids, infants and even dogs. Customers write that they tend to run a little large, but they’re warm and comfortable on a cold winter night. Cotton pajamas a great choice for hot sleepers because they're not as heavy as fleece pajamas, and cotton is machine washable. This festive PJ set is 100% cotton, and it’s a super-comfortable choice for anyone looking to purchase a matching set for their family. Each pair has a cute Christmas tree graphic on the shirt and a complementary pattern on the pants, making for a whimsical feel that’s distinct from the Fair Isle and Nordic designs typical of the season. It’s also available with a snowman image that’s just as adorable. Available in children’s and adult’s sizes, the pajamas are high-quality—with customers writing that they’re super comfortable, breathable, and durable. In other words, everything you want in a cotton pajama set! Fleece is one of the warmest fabrics out there, and the whole family can wrap themselves in this luxurious material with the PajamaGram Onesie Nordic Fleece Matching Family Set. With a Nordic-inspired print featuring reindeer and snowflakes, it’s sure to make the holidays merry and bright. The pajamas even have hoods, feet, and extra-deep pockets for added warmth, and the mid-weight micro-fleece keeps things soft and breathable. Additionally, the pajamas are available in sizes for adults, children, toddlers, infants and pets, and customers say they’re a huge hit with the whole family. 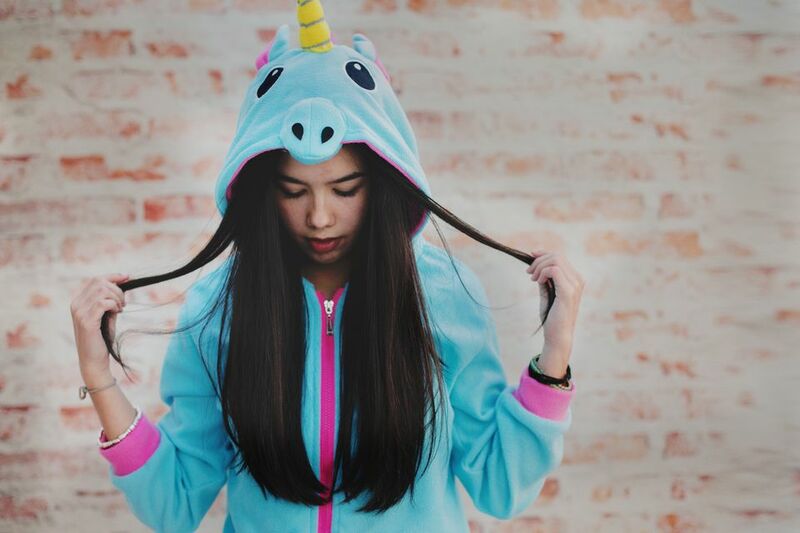 Footed pajamas aren't just for babies anymore! If you're looking to bundle up from head to toe this year, these holiday-themed footed pajamas will keep you super warm. They're made of 100% polyester fleece and feature a delightful Christmas pattern complete with snowmen, ornaments, and Christmas trees. Just be sure to check the measurement chart online before you order, since you’ll want to make sure you get the foot size right. If you’re worried about getting cold feet this season, don’t overlook footed pajamas when searching for the perfect set of matching pajamas. They couldn’t be any cuter, and you’ll thank yourself when everyone’s feet are toasty warm on a chilly winter morning. If you have a love for all things Disney (or know someone who does), then these matching pajamas are a top-notch option. The bottoms combine a classic Fair Isle pattern with iconic Disney imagery, while the tops feature Minnie and Mickey front and center. If your family is planning on making the trip to Disney World this year, be sure to pack these pajamas to make the occasion extra special. The Jammies For Your Families Disney's Mickey & Minnie Mouse Family Pajamas are available in men and women’s sizes, with options for kids, toddlers, infants and pets. Girls can also choose a Minnie-graphic nightgown, which even includes a matching small-scale gown for their favorite doll. In the dead of winter, nothing’s better than a warm pair of flannel pajamas. While you wouldn’t want to wear them in August, the whole family can look forward to breaking out this matching set from PajamaGram every holiday season. These full-length plaid bottoms are classic in every way, with a red plaid pattern that should complement your Christmas decor, and a long-sleeved thermal top (also red) to keep everyone cozy. Made from a cotton and polyester blend, the PajamaGram Classic Flannel Plaid Matching Family Christmas Pajama Set comes in sizes for adults, kids, toddlers, infants and dogs. Customers say the color is a spot-on Christmas red, and the material is incredibly warm and soft. Want to make this holiday season as sweet as a candy cane? These striped pajamas nail the holiday spirit down to a T, with a red-and-white pattern that will get the whole family in the mood for Christmas. Made by Burt’s Bees—yes, they make clothes too!—this 100% cotton set is available as a matching striped top and bottom for infants, toddlers, kids, and women, and can also be purchased as a striped bottom/red Henley set for men or women. However you choose to mix or match, it’s sure to make for some great photos this holiday season. The pajamas are machine washable and available in a broad range of sizes, including sizes for newborns. The extra-soft organic cotton also guarantees that they’re comfortable for sleeping, lounging, and opening presents.